Ever wondered how to make bubble tea? 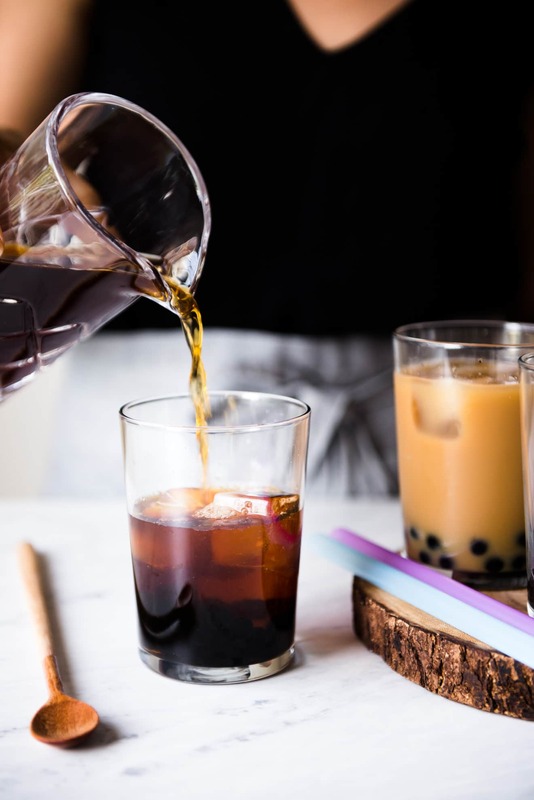 Here is a simple bubble tea recipe that shows how you can make this beverage at home! Bubble tea is one of my favorite things to sip on during the summer. 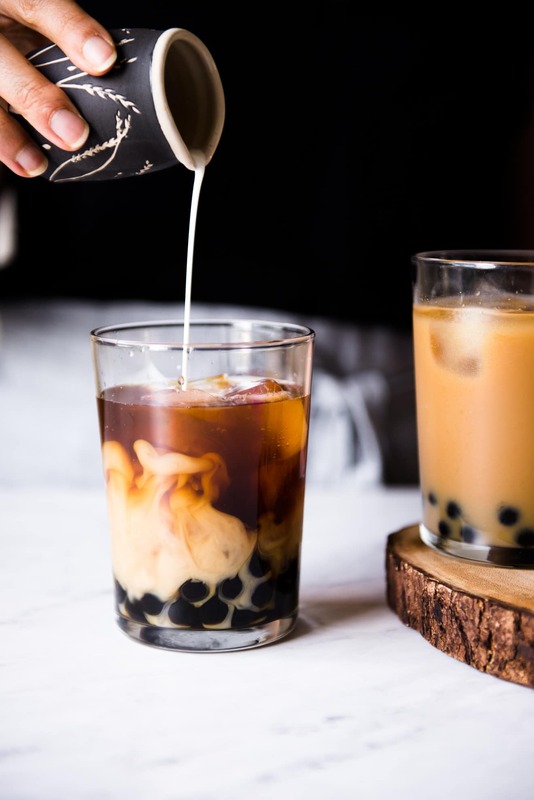 Originating from Taiwan, bubble tea (波霸奶茶/珍珠奶茶) usually consists of sweetened tea with milk and the characteristic chewy tapioca balls, also known as boba (波霸). 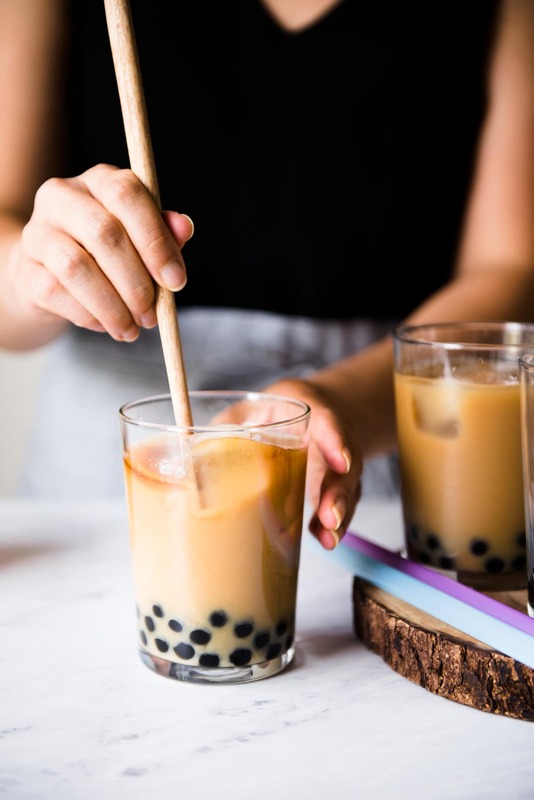 Bubble tea comes in many flavors: plain tea flavors such as black or jasmine tea, fruit flavors such as strawberry or honeydew, and even taro, which is a root vegetable commonly used in Asian dishes. (You can read more about the history of bubble tea here). While I enjoy drinking bubble tea, I don’t particularly like the ones sold in the teahouse chains because they contain too much sugar. The good thing is that you can make bubble tea at home easily! 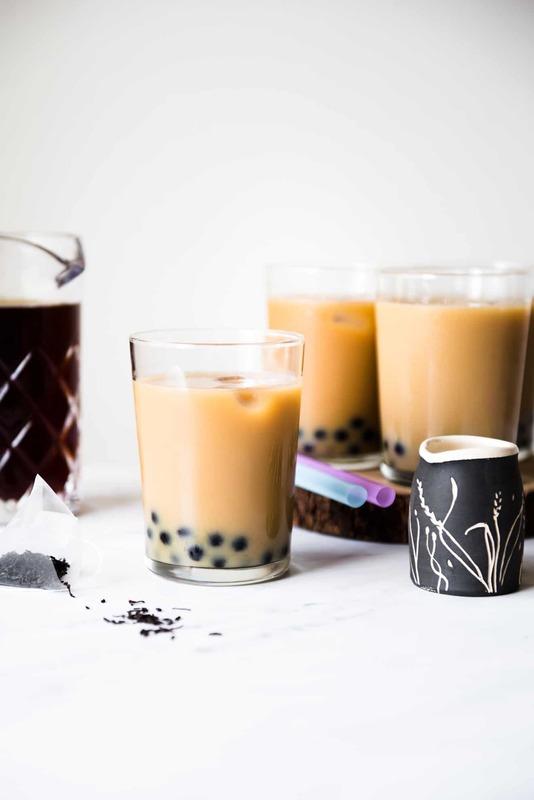 In this bubble tea recipe, all you really need is tea, tapioca pearls, milk, and a sweetener. The best kinds of tea to use are those that have a robust flavor, such as black or jasmine tea. Chai tea works as well. Because you will water down the tea with milk, you want a strong tasting tea that will retain its flavor. 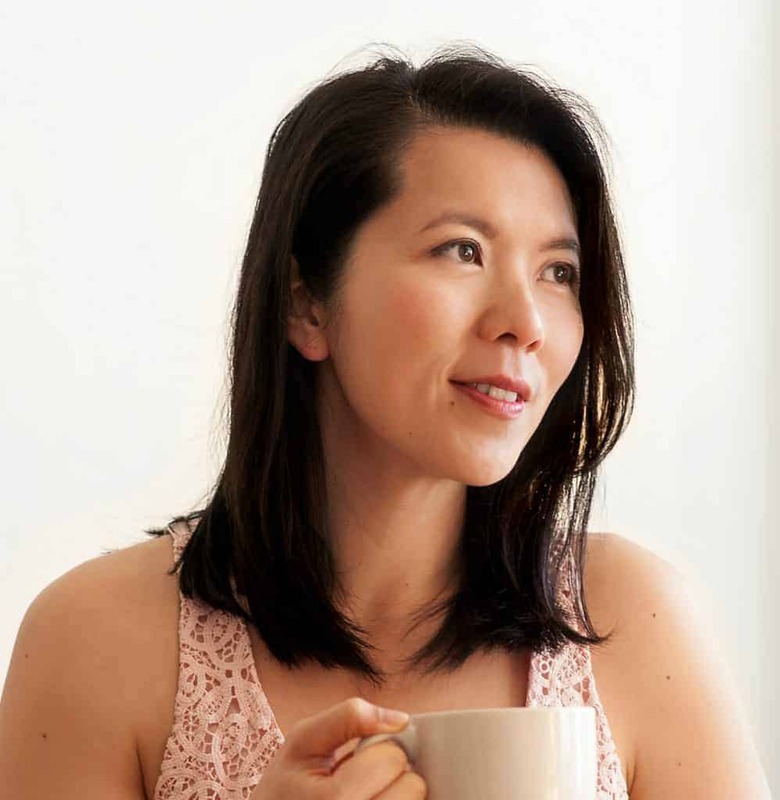 I used Numi’s Chinese Breakfast Tea for the recipe, but any strong tea will work. WHAT KIND OF TAPIOCA PEARLS DO YOU USE? I typically use this brand of tapioca pearls, which cook in about 5 minutes. I like that they cook quickly, but the texture could be better. (For reference, slower cooking tapioca pearls can take up to an hour to cook.) 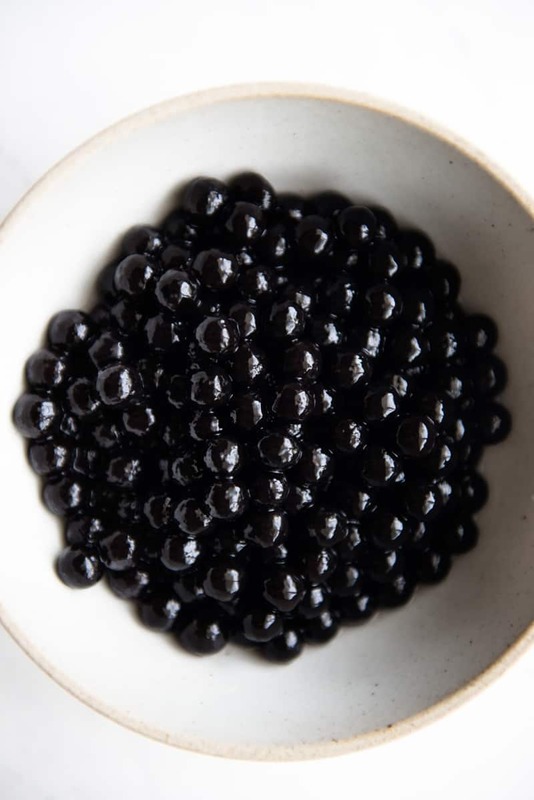 One important thing to note about these quick-cooking tapioca pearls is that you should not make them ahead of time. The pearls start to stiffen in just 1 or 2 hours, so they are meant to be served immediately after they’re cooked. 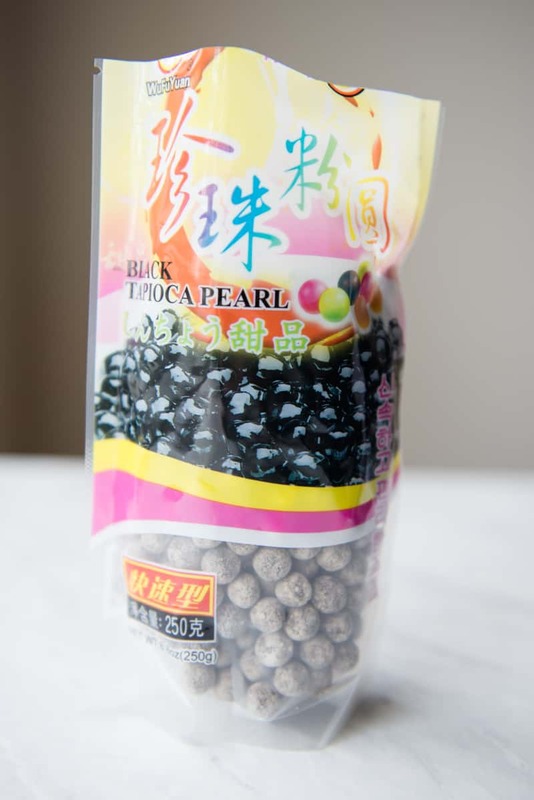 You can find these tapioca pearls in Asian supermarkets or on Amazon. WHAT KIND OF MILK DO YOU USE? CAN THIS BE DAIRY FREE? I prefer using whole milk the most because the rich flavor makes the beverage tastier overall. I tried a version of the bubble tea with heavy cream. While the flavor of the tea was even better than the version I made with whole milk, it felt too decadent. Perhaps using half-and-half is a good compromise? You can also make a dairy-free version with nut milks or soy milk. I tried using canned coconut milk once, and the coconut milk left a funny feeling in my mouth. It felt as if my mouth was coated with a thin layer of coconut fat. WHAT KIND OF SWEETENER DO YOU USE? Any kind of sweetener works. However, I do want to point out that if you use honey (or any thick syrup), it is best if you mix in the honey while the tea is hot so that the honey can dissolve evenly. The same goes for granulated sugar. Of course this will mean that you’ll have to approximate how much sweetener you’ll need before the bubble tea is ready for tasting. You’ll probably need at least 2 tablespoons of honey for every 2 cups of tea. Because everyone has different preferences for sweetness, I recommend preparing simple syrup and having each person add however much simple syrup they want into the drink. Simple syrup is easy to prepare. Heat 1 cup of water in a saucepan and add 1 cup of sugar once the water starts simmering. Stir until the sugar dissolves and turn off the heat. Once the simple syrup has cooled, bottle it up, and it’s ready to be used. 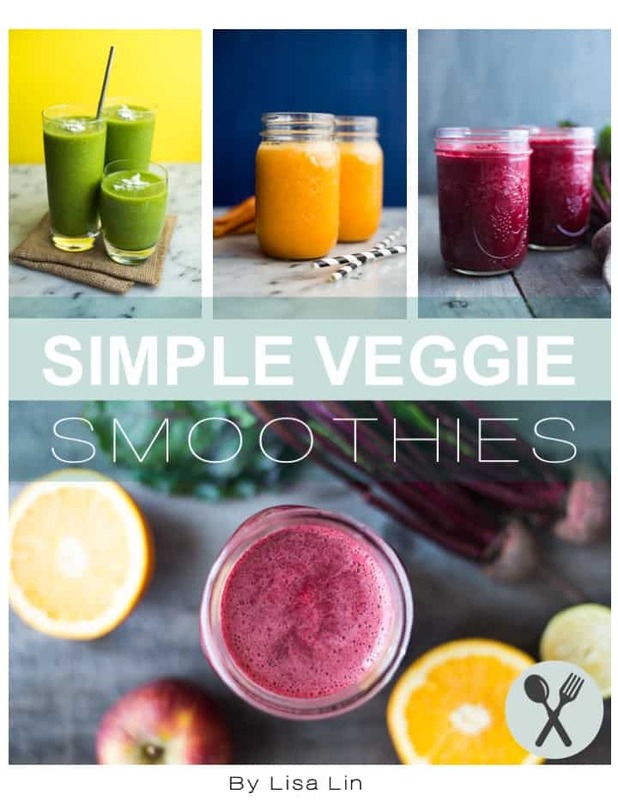 Typically, I use about 2 tablespoons of simple syrup to each drink, just so it tastes barely sweet. Some people might want more syrup in there. 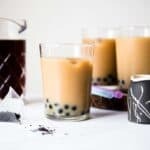 CAN YOU MAKE THIS BUBBLE TEA RECIPE AHEAD? You can steep the tea 1 or 2 days before and store it in the refrigerator. Also, you can make the simple syrup several days ahead. I wouldn’t recommend cooking the tapioca pearls ahead because the pearls harden quite quickly. So excited to try this!! I remember the craze when everyone was meeting for bubble tea. I’d definitely rather make it at home! Thanks Lisa! I love the flavor of the taro , do you have a recipe for taro bubble tea? I do not, but it will be something that I’ll explore! Thank you so much for catching that! It should say “1 cup sugar.” I have edited the recipe to reflect the correction. I tried this recipe and I don’t know if it’s the sweetener that I used, which was honey or the milk that I used. I used soy milk, organic one. But it wasn’t so much of my taste. It’s my first time making milk tea boba with black tea and soy milk so it was all new to my tasting. Whenever I would make it just for fun, I would use Green Tea and Coffee Cream as my milk. However, it was good overall! Thanks for the feedback, Mai! I have tried it with soy milk before and didn’t like it either. That’s why I recommend using whole milk. Any suggestions on how to make grapefruit royal tea? It’s my favorite at the tea shop and I’d love to make it at home! Hi, Cady! I’ve never heard of that before. What does it taste like? Just made this for my granddaughter, she loves bubble tea. Took a trip to the Korean Market and got the ingredients, made adjustments to suit her taste. Used multi-color tapioca pearls, Fairlife milk and English Breakfast tea. She really enjoyed the treat tonight. Score one for gram! Depending on the type of teas used, the bags really should be removed. As the leaves steep, they begin to release tannins which make the drink incredibly bitter. More oxidized, robust teas will easily make your drink too bitter if steeped more than the recommended 3-5 minutes. It really does depend on the brand/variety, but beware!